Remastering old games is relatively easy. Just spice up the graphics and perhaps smooth out controls a bit and that’s it. Remaking is another story, though, especially if it concerns such a classic video game as Resident Evil 2, something that’s loved and cherished by a whole generation of gamers who first experienced it over 20 years ago on PlayStation 1. It refined what was started in its campy prequel to a real breed of survival horror. So, how do you make a classic again? If you stay too close to the source, the game’s essential parts might turn out outdated by modern standards. If you make too many changes, it’s not the same game anymore. However, enough water has flown under the bridge that most details have faded into blurred memories, and it’s there where Capcom has found a golden middle way. Resident Evil 2 Remake is delightfully old-fashioned but undeniably crafted with a modern know-how. Resident Evil 2 takes place immediately after the first game that was remade for Nintendo Gamecube and that in turn enhanced to the current console generation. Claire Redfield arrives at Raccoon City to search for his brother Chris, who was part of the S.T.A.R.S team during the infamous Mansion incident. Meanwhile, Leon S. Kennedy is about to start his first day as an officer among the ranks of Raccoon City Police. Only, it could prove to be also his last day in the job as the whole city is taken over by blood-thirsty zombies. Claire and Leon meet up with each other and rush it to the police station outskirts, only to be separated again. Nowadays, it’s not much of a spoiler what’s causing all the ruckus. We all know that it’s shady Umbrella corporation that has cooked up deadly viruses in their labs. Of course, Claire and Leon are initially blissfully unaware of it and it’s up to the player to lead either of them to the source of evil. It hasn’t been all quiet in the Resident Evil front in recent times. Two years ago, Resident Evil 7 was met with an enthusiastic critical and commercial success. I beg to differ, though. The first mistake the game did was moving the action to the 1st-person view. It just doesn’t feel like Resident Evil that way. Also, it introduced unnecessary, badly grounded new characters. The franchise features such a stellar and established cast that new heroes (and villains alike) are ultimately pointless. So, return to the golden age with young Claire and Leon starring in the game was more than welcome. Resident Evil 2 puts the perspective back to the 3rd-person, too. 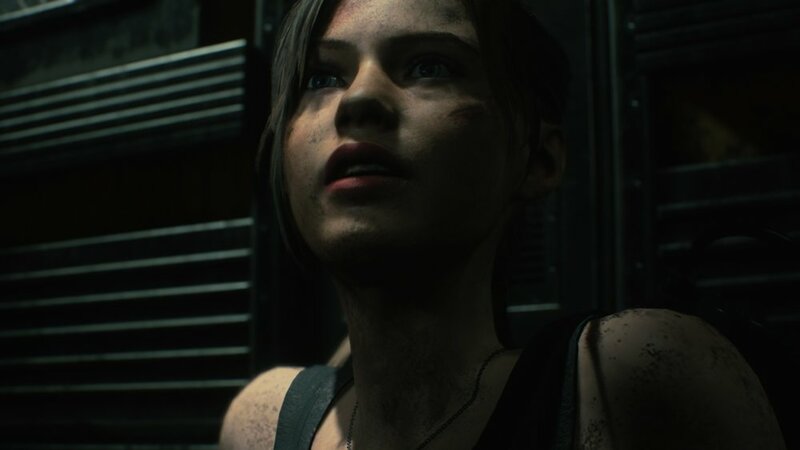 Instead of fixed camera angles of the original game, Claire and Leon free-roam around venues, from Raccoon City police station (built into an old art museum for a splendid impression) to the sewers and eventually to an underground laboratory. RE7 suffered from being also a VR game which meant compromises in the visual fidelity. Come on, what’s survival horror without a flashlight casting eerie shadows all over the place? It’s back in RE2 and works to a great effect in mostly dim-lit surroundings. Resident Evil 2 Remake is beautifully old-fashioned in its gameplay design. While most modern games tend to burst into every direction, RE2 makes excellent entertainment within tight boundaries. It’s at the same rambling and disciplined. Each venue is basically open to explore, but advancing in the story takes solving puzzles along the way, gradually extending the playing area. It all is rather cleverly constructed as you can’t hit impasse because there always is something you just haven’t noticed yet. RE2 won’t hold your hand and guide you along the way, either. When you acquire a new key or an item, you have to figure out their use at your own as the game’s not telling it or where to go next. Good memory – or keeping notes with pen and paper – goes a long way in paving the way forward. You’re also supposed to examine and manipulate inventory items, just like in the old days. And of course, there’s managing the limited inventory and bypassing it with universal storage boxes scattered around the maps. You always have to ponder what you’re going to need and what perhaps not. In short, the game is pure bliss! It’s just like playing a Resident Evil experience like it was 20 years ago. Mind you, it really is that much time since I played the original RE2 so recollections about progressing in the game was beyond a hazy distance at best, so it felt pretty much like experiencing it for the first time. Much of the original content has been cut, re-arranged and streamlined for a greater dramatic effect, too, so even veterans might need to scratch their heads once in a while. When you arrive somewhere, you’ll notice there are usually multiple directions to go to. It’s bound to be frustrating at first as you won’t always be knowing whether you chose a reasonable path or were you just wasting your precious resources killing filler zombies in the way. There are some modern quality-of-life features, though. The inventory space can be expanded with numerous hip pouches you’ll find and items that has served their purpose are clearly labeled as disposable so you know when to discard them instead of carrying them endlessly around. The map marks items you have checked out but not collected yet so it’s not resulting to a guesswork or hand-written notes as to where you left them. On normal difficulty, you won’t be needing ink ribbons to make manual save at typewriters at several locations, and there are also auto-saves before critical moments. Forgetting the gung-ho tactics the franchise fell into with overvalued Resident Evil 4, the new Resident Evil 2 puts horror back into survival horror. I can’t remember the last time I was this anxious at every step I took, with brown trousers alert around every corner (of course I can remember, it was in Alien: Isolation five years ago but I used my wording for dramatic purposes!). This, my friends, is classic Resident Evil at its finest, too. Thankfully, though, Capcom didn’t stick with tank controls of the original game. Still, the gameplay rules are strict and you just have to abide by them. Controlling Claire and Leon can feel a bit clunky but their movement is nicely paced to their brisk animation. There are no unarmed attacks of Resident Evil 6 to ease the way or any dodge rolls to shake off pursuers. The closest to hand-to-hand combat are sub-weapons, like knives or grenades, to shove away hugging monsters with (of course, you can try completing the game knifing all the way but blades degrade and need to be replaced). The danger the game presents isn’t just about dealing with deadly Lickers, avoiding Mr. X who appears always at most inappropriate places or fending off G-virus off-springs and the horrific Tyrant. Basic zombies’ grab range is increased from the series staple so even they can provide a sense of terror instead of shambling there like slalom poles. The best horror comes from the anticipation, though, that tangible feeling that something’s going to grab you any minute as you wander about dark corridors with an erect flashlight - and isn’t that long catwalk just like it’s paving the way for a boss monster to appear? What RE6 did really well were the boss fights and RE2 takes its cue from there. Defeating Tyrant and co. isn’t so much about dealing damage as it’s scraping them enough with well-placed shots to make the fights advance through their staged phases, sometimes needing manipulating environmental objects, a task that’s made harder by your heart that’s racing like a horse as you swerve around to avoid punishing swipes. When most modern games try to be embarrassingly true-to-life, RE2’s characterization is delightfully cartoonish. Leon is somewhat overwhelmed as his first day in the job turns out to be more than he bargained for. He’s more likely a hero than Claire, who as barely out of her teens is heated and slightly indifferent (and curses a lot!) until she finds something to care for. Claire’s and Leon’s campaigns share the same ground for majority of their running time but there are important differences. Further in the game, Claire catches up with young Sherry Birkin (who will later in the timeline be playable in RE6) while Leon spends quality time with mysterious Ada Wong (who finally looks Chinese like she should!). Raccoon City and its iconic, rundown locations have never looked better – nor have Claire and Leon. Their character models look like real people (they should as they’re face-scanned from young and attractive fashion models) but they don’t fall into awkward uncanny valley of big Western games. The fact is that the Japanese just make these things better as their holistic approach keeps character models bold and clearly defined instead of patching them together from ill-fitting parts and plastering them with hundreds of wrinkles, spots and moles with a pair of beady eyes somewhere within all the unnecessary detailing. I must admit that Claire’s looks are absolutely to my liking, she’s cute and hot in a characteristic manner. To be fair, I’m sure Leon’s handsome and youthful features will please female audiences (and those who prefer males). Sadly, the few supporting characters (apart from Ada) aren’t of the same high quality. Realistic graphics also mean that the goriest scenes can be quite off-putting with no blood and pus spared. All things considered, Resident Evil 2 is inspirational and intense gaming like no other, I simply couldn’t put it down. The first playthrough can take anything between 5-10 hours depending on your playstyle. There’s an immense replay value, not only to experience the game all over again – which alone would be a reason enough for its gorgeous looks and thrilling excitement – but in addition to campaigns for both characters, there are 2nd run scenarios of them with different scene set-ups. Of course, there’s always beating yourself for a better score, too, with cuts in completion time, deaths and saves. Capcom is also releasing new content to the game for free, with Ghost Survivor mode coming soon. As the game takes place in the late 90’s – there are no smart phones and computers are old pizza boxes - it has timeless quality to it. I applaud Capcom for having the courage to go for such an old-school route all the way with the game, from a disciplined gameplay to a tight pacing, straightforward story and its honest delivery. Still, the game is completely modern in its nature and not a polished relic. When old and new conventions meet this flawlessly, RE2 is a true celebration of sincere video gaming, an art that sometimes is lost among Western triple-A developers and their plodding and misshapen movie wannabes where the gameplay is secondary. If only all video games could be reverted back to this, a pureblood gaming pleasure but still look as amazing as Resident Evil 2. Capcom, how about the same gorgeous treatment for Resident Evil 3 next? Full of subdued innuendo, Little Nightmares is like a demented puppet show or diorama, somehow lifelike but at the same time disturbingly artificial. It certainly doesn't look like your typical game and is a nightmare worth experiencing. Games like Resident Evil Revelations that serve as a reminder of how far this series has gone since its debut in 1996. The Xbox One version of Revelations is a good transfer of the 3DS copy though you can still see the concessions made for the mobile version (the story plays out in different episodes with each being anywhere from twenty to thirty minutes long depending on difficulty and there are “previously…” recap cutscenes). I believe I wasn’t the only one who was excited when Square Enix announced that it will revive the Fear Effect franchise. Fear Effect and its prequel Fear Effect: Retro Helix were hard-boiled and cinematic action-adventures released on PlayStation One. Their unashamed millennial violence was something that captured imaginations of players who were sick of pansy mass-marketed games. French indie studio Sushee is already busy building up re-imagination of the original Fear Effect, but first they came up with a new entry to the series. Years in the making, the love-child of a small Norwegian development team D-Pad Studio, a retro-platform adventure Owlboy, finally premiered on PC two years ago to good reviews. Now that the game has landed on three major consoles, how does it fare at its true home soil? After all, it pays a substantial homage to the 16-bit era platformers, both in the gameplay and presentation with its lovely pixel art. After seeing Owlboy through and leaving me with a major headache, I have advice to any indie developer: not everything in the old games is worth remembering for, let alone copying. Hitman 2 caters for all kind of virtual killers, from bulls stuck in a china shop to meticulous murder artists, thanks to a flexible and versatile sandbox wrapped in aesthetic I can only describe as Nordic cool.